The Old Main Society honors those generous donors who have included Mississippi State as a beneficiary in their wills or have made other planned gifts, such as charitable gift annuities, charitable remainder trusts, life insurance policies and qualified IRAs/retirement plans. 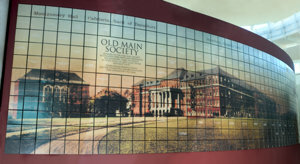 Donors in this society have provided the MSU Foundation with documentation of their gifts. Giving levels within the Old Main Society are based on the donor's cumulative lifetime giving and correspond with the giving levels within the Legacy of Leadership recognition levels. Donors making planned gifts of less than $50,000, or those with undisclosed amounts, are recognized at the Old Main Society member level. Each year, the names of donors within the Old Main Society are published in the MSU Foundation's Annual Report. Donor names are also featured on a special Old Main Wall in the Legacy Hall rotunda of the Hunter Henry Center.